The GEWO Hype EL Pro 42.5 is the perfect rubber for players who want maximum spin at high speeds. Because: "The last point makes you the winner!" The GEWO hype EL Pro 42.5 is the optimal synthesis of power, spin and surface grip (Dynamic Grip Concept), It is the tempo-elastic middle rubber of the GEWO Hype EL Pro Series and offers a balance between a dynamic and punchy game (Power Tension boost), it provides perfect ball feeling with reliability in all game situations. Thanks to the newly developed DGC40+ - surface, it is possible for a good variation between a punchy serve / return game and a balanced all-round / offensive game. A rubber with exceptional speed in reserve, but despite the high speed, allows good control in the more passive strokes when driving blocking, or pushing. 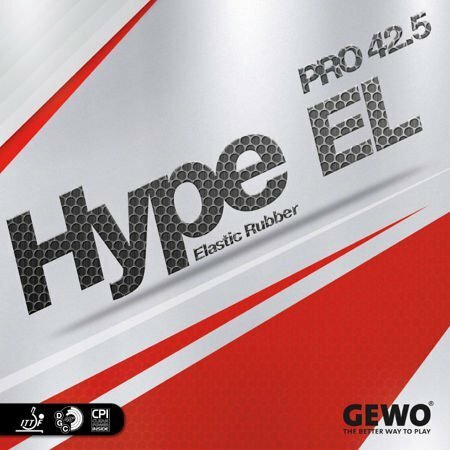 The GEWO Hype EL Pro 42.5 is the perfect rubber for players who want maximum spin at high speeds. Because: "The last point makes you the winner!"